Normally I find just about anything thrown at me from the trough of the Shadow Kingdom Records palatable. Understandably then, I was very excited to hear what they call a perfect 80s psychedelic heavy metal gem, something they uncovered after years of searching, The Mezmerist pair of EPs. Just like many of you, I am sure, I have not even heard of this California 80s band, but Shadow Kingdom were able to track down the band’s mastermind Thomas Mezmercardo. DVD, where Thomas tells how the band and the 80s recordings came to be, is another part of this dual release, but I need to focus primarily on the music, and, sadly, I did not become a fan. An interesting twist for the 1983 release The Innocent, The Forsaken, The Guilty is the fact that none other than Bill Ward of Black Sabbath plays the drums. Not many can boast of this feat, but improvisational percussion of Bill Ward did not save the EP for me. In fact, what is the point of having this drummer extraordinaire when you can hardly hear him? 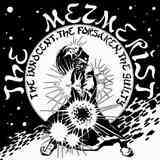 The Mezmerist are after creepy, demented, Mercyful Fate-like atmosphere on the release, and they are accomplishing it with the 80s production. Sticking true to those values on the re-release leads to the sound being rather muffled and flat. The depravity factor is high throughout, emphasized further by Thomas’ manic, high frequency, floating voice, climbing King Diamond high falsettos at times (Arabian Nights). Also prevalent is a mid-Eastern theme, see the aforementioned Arabian Nights song title of the slow rolling caravan riffs of Dead Ones Cry No More. The trouble with me is that the created Hawkwind/The Ritual/Mercyful Fate atmosphere is stuck in place, dribbling guitar tremolos not having any sort of development or definition. I suspect a large amount of improvisation hides in that sound cloud (Dead Ones Cry No More), but deciphering it all takes an effort I could not master. Victim of Environmental Change picks up the pace somewhat, starting with a familiar gallop, but still diffuse guitars take it to the land of ephemeral, the song finishing with some funky rhythms. The second part of the release, the songs recorded for another EP which saw the light of day in 1985 take the wah-wah fuzz off the guitars, but the hooks to die for are still not found on Kingdom of the Dead or No Family, No Friends. I knew my review will not be glowing when my favorite cut on this cult release was the closing almost 9 min instrumental The Jam Song, some sort of heavy metal-tinged wild jazz, with guitars unhinged, bass and drums taking on leads and solos, where allowed. Good stuff there from a talented group of musicians, no doubt. In terms of atmosphere The Mezmerist is squarely in the mid-80s, professing the then popular brand of psychedelic doom metal, but I find it a case of that style gone definitely weird on The Innocent, The Forsaken, The Guilty. Suffice it to say, I won’t be trading any of my King Diamond, The Ritual or Mercyful Fate albums for this impossible to find heretofore EP. I’d say the collectors can keep it, as far as my money is concerned.